Weather in Florida in November is... Fabulous! Florida weather in November is fabulous! It's warm. It's sunny. It's breezy. 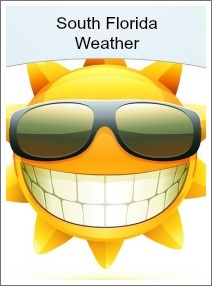 And, it's definitely water sports & sunbathing weather for sure! 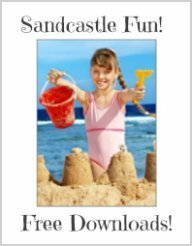 Enjoy it at the beach, in the water, sunbathing or just get your toes in the sand! Either way November weather in Florida is something for everyone to enjoy! Starting in November, people travel to South Florida in leaps and bounds to enjoy Florida's warm and sunny winter months! This is the month when tourist season begins in Florida! With an average temperature of 80 F or 26 C degrees, the weather really, truly is nice enough and warm enough to sunbathe in November, or do the beach, poolside or boating. Outdoor water sports are enjoyed all year-round here in South Florida! This photo below was taken the end of November and you can see how nice the weather is! With the Florida tourist season upon us, it means all the tourists and all the part-time Florida residents (aka snow birds) return to spend the winter months in South Florida to enjoy the wonderful South Florida weather! It also means that the population nearly doubles in size! be sure to plan ahead! Additionally, a lot of people choose to spend their Thanksgiving holiday in a warm, tropical climate and they pick South Florida because of the wonderfully warm weather in November! How about outdoor dining on Thanksgiving Day! 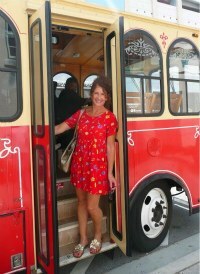 I speak from my personal experience because one year I was one of those tourist during Thanksgiving holiday! I spent my Thanksgiving holiday on Delray Beach absorbing the warm Florida sunshine! There's no place I'd rather be on holiday than Delray Beach on Thanksgiving Day with the the average water temperature of 76 F or 24 C degrees and of course the warm Florida sunshine! the warm waters of the Atlantic Ocean in November! 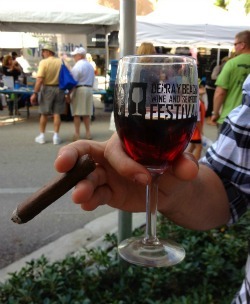 Wine & Seafood Festival is in November! 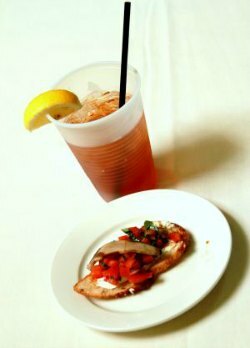 November 2012, was our very first Wine and Seafood Festival beach side! 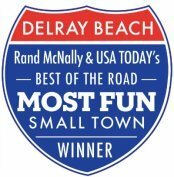 This is now one of our annual events and it's just one more reason why you should come to Delray in November! This is a 2-day event and it is free to attend! Learn wine pairing with a daily wine pairing schedule to choose from, enjoy live music and delicious, tantalizing seafood right next to our beautiful beach at A1A and Atlantic Avenue. Average beach water temperature in November is 76 degrees! The average weather high temperature in November is 80 degrees. The average low temperature is 66 degrees. The average precipitation is 4.57. The beach water in November is warm so bring the bikini and sunscreen because you'll need it! Holiday Decorating Begins in November! 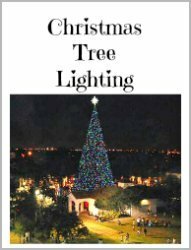 In November, the assembly of the 100-Foot Christmas Tree begins in downtown Delray and the downtown businesses and our lovely hotels begin their decorating too! 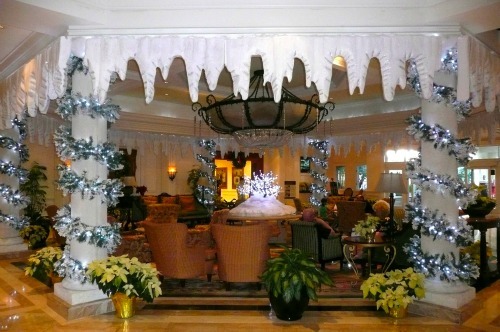 Here's a photo of the Marriott lobby decorated for Christmas! Holiday season is spectacular here in Delray Beach, FL! Be sure to see my web page dedicated to our holiday events! 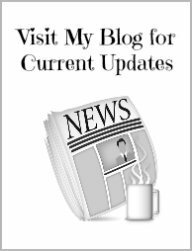 Subscribe to my free eNewsletter right here or click on the image below. 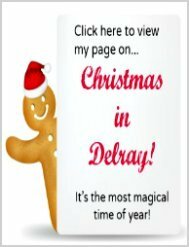 Grab Your Free Delray Beach Vibrations Newsletter! 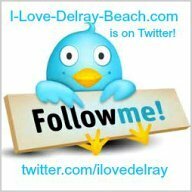 I promise to use it only to send you Delray Beach Vibrations.